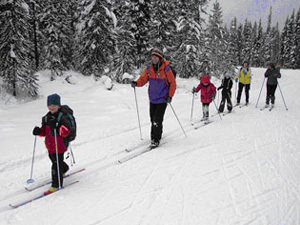 Come Explore… and enjoy the pristine nature path and ski trails at Rundle’s Mission on the NW shores of Pigeon Lake. Rundle’s Mission Society … is a not for profit volunteer organization that has been part of this community since 1956. It is home to the Benjamin and Margaret Sinclair Provincial Historic site which includes an outdoor interpretive boardwalk featuring the history of the area. The on-site rental facilities are perfect for retreats, meetings, youth groups, weddings and families. Overlooking the lake, the small church and hand-hewn lodge make a perfect setting for your special day. Nature enthusiasts will appreciate the 220 acres of nature conservancy right next door. Our trails consist of 5 different loops on 220 acres of Nature Conservancy. The trails are gently sloped and you may choose to complete the entire circuit (6 km) or just one or two loops. As you enter the Rundle’s Mission site drive to the top of the hill where there is a road to your left that goes behind the guest houses. You may park here and will see the trail head between the two houses. There are several maps on the trail for your reference. If we respect this site and stay on the trails we will continue to enjoy these trails for many years to come. *Ski Trails are groomed and track set by Trax Unlimited. 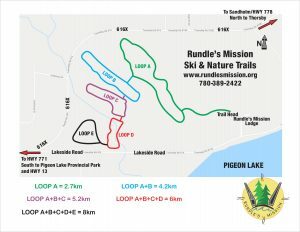 If you would like to contribute to the maintenance of these trails please send your donation to Rundle’s Mission Society. If you are looking for another challenge head over to Pigeon Lake Provincial Park. It is only 10 minutes away and also provides groomed trails. 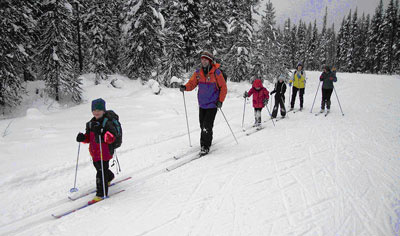 Become a member of the Pigeon Lake Nordic Ski Club and you will receive updates on the ski conditions. If you are a member of a ski club think about Booking a weekend retreat to Pigeon Lake and stay at Rundles Mission Retreat Center!